Summary: The annual insolation of planet earth does not change during Milankovitch cycles. Instead it is the distribution of solar energy with latitude and with season that determines the earth’s climate. The most surprising result of this study is that the latitude gradient of summer insolation seems to determine the onset of glaciations. As a result of this we can predict that the next glaciation would naturally begin in 7000 years time. I have been looking in detail at how long term orbital changes can affect the distribution of solar energy with latitude and with season. These results are taken from calculations based on Laskar’s LA2004 orbital solution which covers the last 50 million years and future 10 million years. First we look at the calculations over 6 million years for the seasonal monthly changes in daily insolation at 65N. 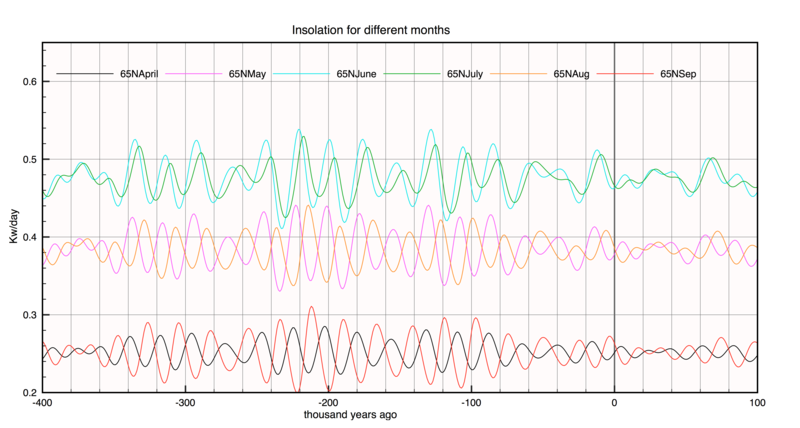 Figure 1: Daily average insolation calculated at 65N for different months over a 6 million year period. Monthly averages for all 12 months are plotted. Jan-June are shown in red, while July-Dec are shown in blue. The green vertical lines shows the same pattern repetition in the future already occurred 2.8 million years ago. The plot above shows a more detailed look on how precession works to balance spring insolation against autumn insolation. Note that there a slight difference in timing depending on the choice of June (May21 – June21) or July (June 21 – July 21). This is due to the precession term changes in summer equinox. For the rest of this study we use the July figures, as do most other authors. Next we look at how solar insolation varies with latitude during the peak summer month – July. The data covering the last 800,000 years of glaciations are shown in Figure 3 below. The insolation values plotted are for 6 different latitudes 90,80,70,60,50 and 40. 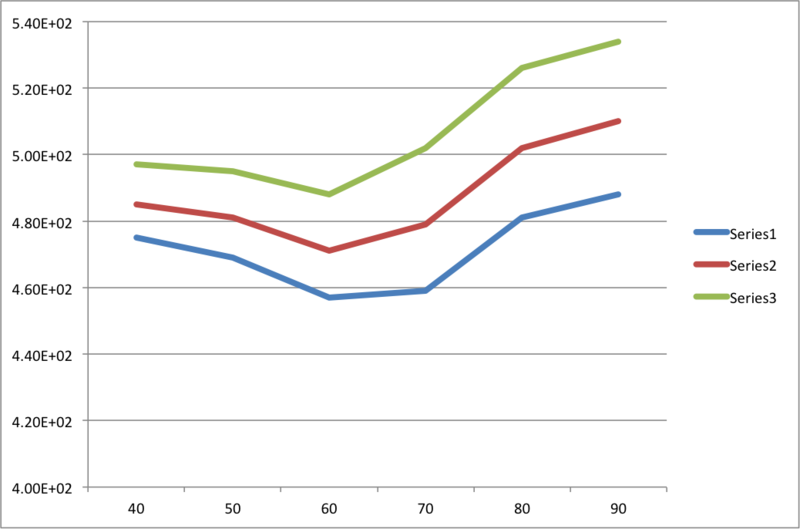 In addition we show in orange the difference in insolation between the pole (90) and 60N. Figure 3: Ice Volume is shown in cyan and the Epica (Antarctic) temperatures in red. The top graph shows the latitude dependence for July insolation for different latitudes. The greatest spread is between 90 and 60. This 90-60 differential is shown plotted below in orange. The 10k rolling average is shown in red and follows 41K the obliquity cycle. The blue arrows show coincidences with large and small interglacials whereas the lower blue curves show transient warming events. In general GISP Greenland data show stronger effects correlated with 65N, but they only cover the last 200k years. It is well know, and confirmed here, that major terminations and intermediate ice melt-backs always coincide with maxima insolation. However, when two large maxima occur in quick succession at high eccentricity, the second one has little effect. It would appear that the gap between two peaks must be at least one obliquity cycle of 41,000 years to have a strong effect. This could be related to an albedo like hysteresis effect on growing ice sheets. At the summer equinox the net insolation received each day at the pole is the highest anywhere on earth. 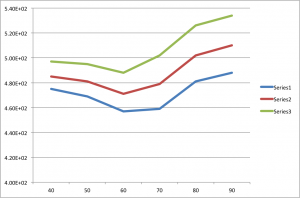 This average reduces to a minimum at 60N, but rising into a V-shape increase by 40N. This shape is dependent on orbital parameters. Three typical profiles are shown in figure 4. Northern Hemisphere weather is driven by the temperature gradients between mid latitudes and the pole. The data show that the largest gradient(DS) in summer insolation is between the pole and 60N and varies with obliquity and precession. This is shown by the orange curve in figure 3. What is very interesting however is to study not the maxima, but the minima in DS. These minima consistently correspond to strong cooling periods throughout the full 800,000 year period, corresponding to an increase in (Benthic Fora) ice volume and a decrease in Epica temperatures. This is shown in figure 5. Figure 6: Detail of last 200,000 years. The lower olive curve is the S(Pole) – s(40) difference. This shows stronger variability of the same cooling effect. The next minima occurs in 7000 years time. There is good agreement. Minima never occur within an interglacial, except the interesting case 190,000 years ago, coincident with a maximum in polar insolation. The large peak in 65N insolation gets cut short, leading to a rapid fall in temperature and increased glaciation. Assuming these observation are correct, then it is a simple matter to ‘predict’ when the current interglacial will end. Sawtooth interglacials like the Eemian 120,000 years ago and especially the Anglian 400,000 years ago always end at the next DS gradient minimum. The most recent glaciation is also similar to the Anglian since both ended when the 400,000 year eccentricity modulation was at a minimum. The insolation data can be extrapolated forward to successive minima as shown in figure 6. The next minima will occur in 7000 years time. Under normal circumstances this minimum would naturally terminate our present Holocene interglacial, and probably also end human civilisation. Could global warming delay the next ice age? Anthropogenic Global Warming is real but its long term effects are still uncertain. The best measure of such effects is climate sensitivity, or the net warming caused by a doubling of CO2. Despite 30 years of research this value has remained unchanged in the range 1.5 to 4.5C. Why is there no progress despite huge investment? I think the basic problem is that there is a communal agreement that all climate models are valid. However, that can not really be the case as I described here. Climate sensitivity must have an exact value, but scientists are reluctant to give any preference on this, lest it damage funding for rival modelling groups. Therefore I will give my best estimate based on those models that best fit the measured temperature data. The answer is ECS=2.3±0.5C. Warming at this level is serious but not disastrous, since we know that such levels have occurred many times in the past. CO2 levels must eventually begin to fall within a hundred years from now, because by then we will either have developed alternative energy sources, or else society will have already collapsed. The biggest question 2000 years from now will be whether global warming has been sufficient to delay the next ice age by 50,000 years. Assuming we are still in control of our destiny then, we will likely then be trying to keep CO2 levels artificially elevated. Updates: thanks to Lance Wallace for correcting spring/autumn mistake. This entry was posted in AGW, Climate Change, Ice Ages and tagged CO2, Ice Ages. Bookmark the permalink. It seems to me that the current Holocene is presently panning out rather differently to other earlier interglacials. Its high point was lower than previously and that lower level seems to have persisted overall for the first ~7000 years with a diminution of only ~0.007°C / millennium. Now at ~11,000 years the Holocene seems to be somewhat extended already. My simple calculations below show a tipping point at ~1000 BC and thereafter cooling at a twentyfold increased cooling rate of about ~-0.14°C / millennium. Extending that overall cooling rate for the next 7000 years would give drop in temperature of ~1.0°C. That would seem to coincide nicely with your 7000 year prediction as that ~1.0°C temperature drop should be enough to induce a full glacial age as it has done before. However I do not believe that it will all be plain sailing up until an abrupt end of the extended interglacial. I think that there will be several progressively more severe “Little Ice Age” episodes on the way. These are just as likely to have dire impacts on humankind and the biosphere as they have had before. Incidentally I am not of the opinion that any anthropogenic induced CO2 warming can ever have any useful positive influence to defer the march of the planetary clockwork. Yes the maximum solar insolation in the northern hemisphere was about 10,000 years ago. Since then the tilt of the earth axis has been reducing. The Holocene maximum was probably about 7000 years ago which coincides with a maximum tilt. You can also see that in the Greenland ice core data GISP2 and in Marcott’s proxy data. Unfortunately GISP2 only goes back 50,000 years, which is why I use the Antarctic data from Epica. Minimum obliquity (tilt) is due in 10,000 years time but a minimum in 65N June/July insolation is occurring now since NH summers coincide more or less with Apehelion of the Earth-Sun orbit. CO2 will have no effect on the orbital variations of the earth’s orbit. However, if we can keep the Arctic artificially warmer than it otherwise would have been we might avoid run away growth in NH ice sheets. Perhaps we can use Carbon Capture and Storage. We burn coal, extract the CO2 and pump it under the North Sea. Then in a couple of thousand years time we can slowly release it again, if CO2 levels start to fall below 280 ppm ! Forests react more to CO2 levels more than cause them. So I would keep as many forests as possible, and cows. After all it is not the poor cows fault that they produce lots of methane, It is more the bacteria in their stomachs. The grass they eat is stored carbon after all. We may probably delay the next ice from starting in 7000 years time, but we surely can’t avoid it starting in 50,000 years time. If March is red and October blue, isn’t it the reverse? October has the highest variability. Sorry! I am currently investigating a process that it my initial calculations are correct will allow us to sequester CO2 and release it at will. Unfortunately, because I do not belong to an academic institution I am not eligible for research council money. It seems incredibly difficult to source research money if you are not part of the academy. If anyone has any suggestions how I could lay my hands on quite a small pot, then your suggestions will be gratefully received. Or if there is any interested academic who will let me jump on their coat tails and so access research money, I would likewise be delighted to make their aquatintance. If this small piece of research proves the viability of concept then I believe we could return CO2 levels to pre-industrial levels within a couple of decades. This would then help show it there is a link with warning and if so would open the path to controlling global climate by sequestrating CO2 or injecting it back into the atmosphere. If sensitivity to co2 is as high as you claim then would we have had a glaciation which started when co2 was at 7000 ppm and never went below 4000 ppm ?en co2 was at 4000 ppm ? Co2 won’t prevent a glaciation, mankind will need other measures, whatever they may be. For 5 million years CO2 has reacted to temperature rather than controlled temperature. Humans are now doing an experiment to see if the inverse is true. We will see in 20 years. After outlining the effects of solar insolation why would you end with “Anthropogenic Global Warming is real but its long term effects are still uncertain”. No where in your article do you mention anthropogenic warming. The article you have written is about solar insulation. Why would you end with “Anthropogenic Global Warming is real but its long term effects are still uncertain”. How does that factor in with solar insolation? After describing the effects of solar insolation, why would you end with “Anthropogenic Global Warming is real but its long term effects are still uncertain”. No where in the preceding dialogue was anthropogenic global warming mentioned.